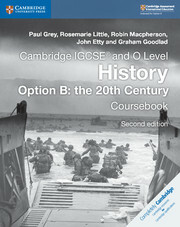 The teacher's resource helps you bring Cambridge IGCSE and O Level History to life, as students explore topics such as the Second World War, the USSR and more. Written in collaboration with an English as an Additional Language specialist, language support sections suggest activities for each subtopic, anticipating common challenges and providing tips to overcome them. This resource contains source material from the coursebook so you have the option to print or project in class for group learning. Sample answers are in the teacher's resource. This card gives you access to your digital teacher's resource on the Cambridge Elevate platform and is available to purchase from distributors. If you wish to buy this resource directly from us, we will email you a book code - please contact your sales consultant or customer services. Editable worksheets in the resource serve as ready-made activities, saving teachers time plotting and designing worksheets of their own. Sections dedicated to language anticipate likely problem areas and suggest ways to overcome them while highlighting helpful academic language students should be using. Suggestions for differentiation activities help teachers give their students extra support or challenge them to inquire further. Ideas for starting lessons, suggestions for making content more active in the classroom and links to historical websites for background reading give teachers a creative starting point for lesson planning. Sample answers and links to assessment objectives help teachers mark and students to understand how to demonstrate their skills. This digital resource contains source material from the coursebook so you have the option to print or project in class for group learning. The Great War: 1914-1918, Section A. Core Content: 1. Key Question 1. Were the peace treaties of 1919-1923 fair?